Oil fields, Photo by Wongaboo/Flickr. Kuwait’s 222-kilometre border with Saudi Arabia was established by Britain in the 1922 Treaty of Uqair. A neutral zone was established at that time and was partitioned in 1966. Kuwait’s 240-kilometre border with Iraq has long been contested. Iraq first asserted a claim to Kuwait in 1938, shortly after oil was discovered in commercial quantities in Kuwait. Iraq formally recognized Kuwait in 1963 but in the following years continued to pressure Kuwait for access to the strategic islands of Bubiyan and Warba. In 1990 Iraq invaded Kuwait and ‘incorporated’ it into Iraq. Following the ouster of Saddam Hussein’s forces in the Kuwait Crisis, the United Nations demarcated the border in 1992, but tension with Iraq over the borders has continued. Bubiyan Island, situated in the north, near the border with Iraq, is Kuwait’s largest island. At 863 square kilometres, it is larger than the Bahrain archipelago. The northern third of the island, consisting of marsh land and creeks, is now a nature reserve. Access is strictly limited, not just for environmental reasons but, primarily, out of military concerns: Iraq has claimed the island in the past. On the southern tip of the island construction of a main port, and residential and commercials area has begun, a project that has generated some tension with Iraq. Kuwait has a desert climate. Maximum temperatures exceed 40 °C – and may reach 50 °C – from May through September. Minimum temperatures in these summer months range from 20 to 30 °C. 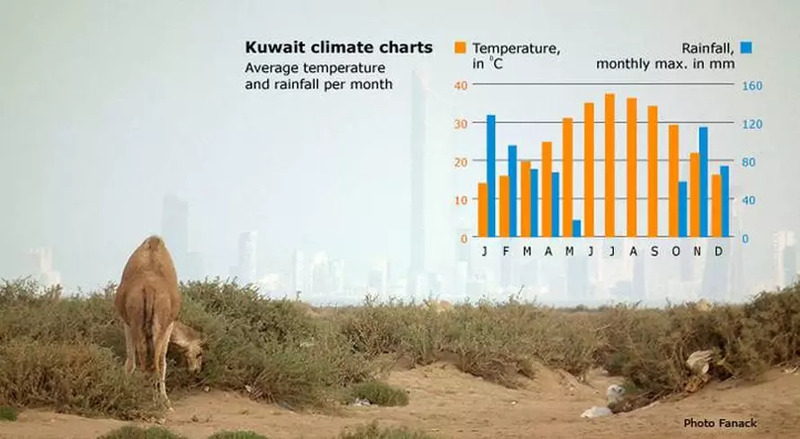 Winter in Kuwait lasts from November through February, with maximum temperatures between 18 and 28 °C. Minimum temperatures in December and January fall to 8 °C and sometimes significantly lower (0 °C or lower). Yearly rainfall fluctuates wildly. The rainy season lasts from November through April. During this period, rainfall can fall in torrents. Maximum relative humidities are extremely high in the winter months, regularly exceeding 90 percent in January. Sand storms and thunderstorms can occur throughout the year but are most frequent from March through September. 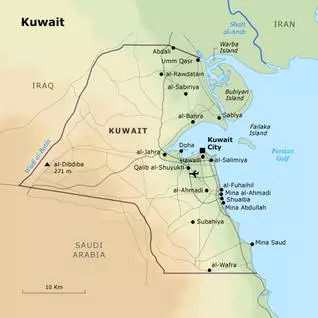 There are three ecosystems in Kuwait: slightly undulating, rocky desert plains (most of the inland area), sand dunes (in the north-east) and salt marshes or mangroves (on the southern coast). Each is host to specific fauna and flora, and each shows signs of overuse and modern industrial pollution. Still, after the winter rains, the country temporarily blossoms. This is the time when the nation’s camels feed on shrubs such as the bright-green rimth (Haloxylon salicornicum) and the red-flowered al-awsaj (Lycium shawii). In the inland wadis (dry riverbeds) – such as the Wadi al-Batin, which constitutes a large part of the country’s eastern border with Iraq – truffles burst from the now slightly moist ground. But in a few days the spectacle is over, and Kuwait returns to its usually arid self. Small Kuwait is home to at least four hundred species of plants and fifty species of mammals. The largest mammals, now all endangered, are the gazelle, the oryx (a species of antelope), and the desert wolf. Smaller indigenous desert mammals include the nocturnal hedgehog, fennec (desert fox), jerboa (a rodent), and caracal (a wildcat). There are forty species of reptile in Kuwait, including venomous snakes such as the sand cobra and the nocturnal viper. Common invertebrates include various species of scorpion, spider, and locust. Almost three hundred species of bird migrate through Kuwait. Among the much smaller number of resident birds are the short-toed eagle and the imperial eagle. Marine life off Kuwait’s coasts has been damaged by overexploitation of marine resources and by oil spills. Local marine life has been abundant historically – due to the anti-clockwise current in the Gulf, which transports fresh nutrients from the Mesopotamian delta to Kuwait’s waters – but local hydrographic conditions have been changing, possibly due to the draining of marshes in southern Iraq and the decrease in freshwater outflow from the Euphrates and Tigris rivers into the Gulf. Fish stocks, including those of the popular and expensive zubaidi (or zobaidy, silvery pomfret, Kuwait’s national fish) and the subur (suboor, sbour) or hilsa river shad, are declining. In the mudflats along Kuwait Bay, crabs, mudskippers (a type of amphibious fish), Socotra cormorants, and flamingos collectively form an intricate, highly vulnerable ecosystem of their own. 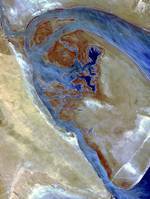 Desertification and the pollution of air and water are matters of local and regional concern. The government has declared 24 April Regional Environment Day, in order to raise public awareness of these issues, and the Kuwait Institute for Scientific Research (KISR) publishes environmental reports. Kuwait’s national pastime of camping nevertheless continues to threaten the nation’s environment. Campers show little regard for vulnerable ecosystems while driving their vehicles off-road, often discarding rubbish along the way. At the government level, short-term economic and political interests generally overrule long-term environmental concerns. 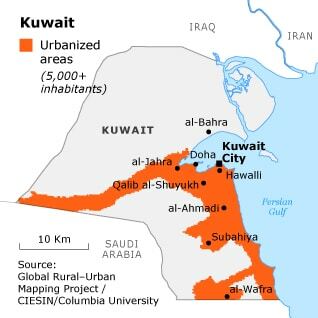 Kuwait was the first of the towns on the southern shore of the Gulf to witness intensive urbanization, which resulted from the sudden inflow of large oil revenues and huge numbers of migrant workers in the 1950s. The development of modern Kuwait City has been based on the principles of a British design firm’s concept. As a result, the city landscape of today reflects Western modernist ideas of town planning, rather than an older, Middle Eastern urban tradition. The Kuwait City metropolitan area has been divided into separate residential, industrial, public, and commercial zones. Its infrastructure has been designed with an individualistic, automobile-driven culture in mind. According to the CIA World Factbook, Kuwait’s estimated population in 2012 was 2,646,314, about half of whom were non-nationals. Most of its population lives in the Kuwait City metropolitan area, making Kuwait one of the most urbanized countries in the world. Practically all of its inhabitants live in the elongated coastal conurbation, which has swallowed up all traditional places of settlement along this section of the Gulf coast. This urban area lies on the coastal plain directly south of Kuwait Bay and stretches from al-Jahra in the west to Mina Abdullah in the south. In the middle sits Kuwait City proper. The capital had an estimated population of 2.2 million in 2009. It is surrounded by residential and industrial districts, many of which were once the sites of separate villages and towns. The largest suburban district is Qalib al-Shuyukh (about 180,000 residents), in al-Farwaniya Governorate, between Kuwait City and Kuwait International Airport. In July 2008 the government of Kuwait approved a USD 94-billion plan to build on the opposite shore of Kuwait Bay, at the present location of Subiya, a city named Madinat al-Hareer (City of Silk). In 2023, the project is meant to deliver, among other things, housing for 700,000 people, several Olympic stadiums, luxury hotels, a new airport and seaport, industrial and business areas, a nature reserve, and the 1,001-metre-high Mubarak al-Kabir Tower. It will be linked with Kuwait City by a 23.5-kilometre bridge.